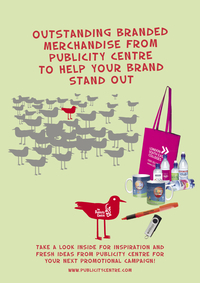 At The Publicity Centre you have found a cost effective single source for all your promotional merchandise and branded gift needs. Our main range of services include promotional merchandise, graphic design, print, exhibitions and displays. We have a proven track record of delivering consistent product and service quality backed by almost 30 years of experience & proven expertise. Our quality control systems are fully accredited and certified to ISO 9001 - 2008 standard. We are fully accredited and certified to ISO 14001 standard proving our commitment to environmental concerns and product sustainability. We have an extensive range of competitively priced products - all designed to support your sales, marketing or communication objectives and help you get your name in front when and where it matters. With our own in-house graphics studio, our design team will ensure that we get the best impact for your logo or message whether it is being used on promotional merchandise, print or one of our range of exhibition display stands. We can make sure your message stands out and that you achieve your communication objectives in an impactful yet appropriate manner. Our overall package is therefore bursting with experience, expertise and proven capability of promotional merchadise which is consistently cost effective. With sales offices in London and Cardiff, we are always happy to help you with advice, costings, samples at any time so please contact us with your next promotional or marketing requirement – simply phone, fax or email us today!